By now, chances are you’ve heard that sitting for hours on end is bad for your health (heart disease, obesity and diabetes have all been linked to prolonged sitting). If you have a job that requires you to sit at a desk for long periods of time then you’re probably familiar with some of the bodily stiffness, aches and pains it can cause as well. Prolonged sitting in a static posture, often in a slouched position, causes excessive strain on certain muscles as well as the spinal discs. Sitting is hard. It’s hard on the body and it’s hard to do correctly. Even as a yoga teacher, I don’t always have the best posture when I sit down to write, especially as the hours go by unnoticed. I know first hand the low back, shoulder and neck pain induced by sitting at a computer all day, and suffered from tension headaches for a number of years. I’ve also worked with a number of individuals, most of whom work at a desk and suffer from chronic neck, back and hip pain. So I know what it’s like for people that have to sit most of the day. From my experience with yoga students (and myself), I also know what’s realistic and what’s really helpful, and have learned that simple is better, you start with what’s doable—and you’ve got to move. You’ve got to somehow stretch a little bit throughout your day, and while the recommended minutes for every 30 to 45 minutes of sitting may not happen, incorporating some brief periods of movement once or twice a day is an improvement from not at all. As your body begins to feel better, the more likely you will be to move and stretch more frequently until it becomes a habit or even something you look forward to. However, setting a timer to remind you to step away from the computer every now and then is always a good idea. Here are three simple yoga stretches you can do at the office to help get you started and give you a little bit of relief from the common aches and pains caused by prolonged sitting. Feel free to break up the moves, doing one or two at a time, but make sure to try all three throughout your day. I like this move because it’s easy to do in a chair and clients are always surprised by how good it feels (and how necessary it is). The tendency is to slouch when seated, tightening the musculature along the sides of the body. Taking a brief moment to do some simple over the head stretches and yoga side bends will not only feel good and help improve your posture but it can also re-energize your mind and help you focus. Seated in your chair with both feet flat on the flow under your knees, press down through the backs of your legs and extend your spine up straight. Take a few deeper breaths and on an inhalation slowly begin to reach your arms over head, turning your palms in to face one another. Grab ahold of your right wrist with your left hand. Next inhale, use your left hand to lengthen your right arm up toward the sky. Exhale and slowly side bend to the left, pulling your right wrist up and over to the left. Inhale to come back up and release your arms back down to your sides on the exhalation. Repeat holding the left wrist with your right hand. Slouching rounds the spine, tucking the sitting bones under, shortening the hamstrings, and placing a lot of pressure on the lower lumbar region of the back. The solution, of course, is to sit up perfectly straight with your sitting bones directly beneath you, pelvis neutral, and low back slightly lifting in and up. How doable that is for a few hours at a time (let alone six hours a day) is a completely different story. A must-do yoga exercise for anyone with low back tension, this modified variation of Adho Mukha Svanasana (Downward-Facing Dog Pose) is meant to open the low back and lengthen the spine while gently stretching the backs of the legs, and greatly improves postural awareness. Begin with your palms on the desk outer shoulder distance apart and your index fingers pointing slightly away from one another. Keep your arms straight and take a big step back, leaning into your palms just a bit. Widen your feet hip distance apart and bend your knees a decent amount. Keep your chest lifted as you press down through both palms and draw your sternum forward, compressing your shoulder blades down your back. 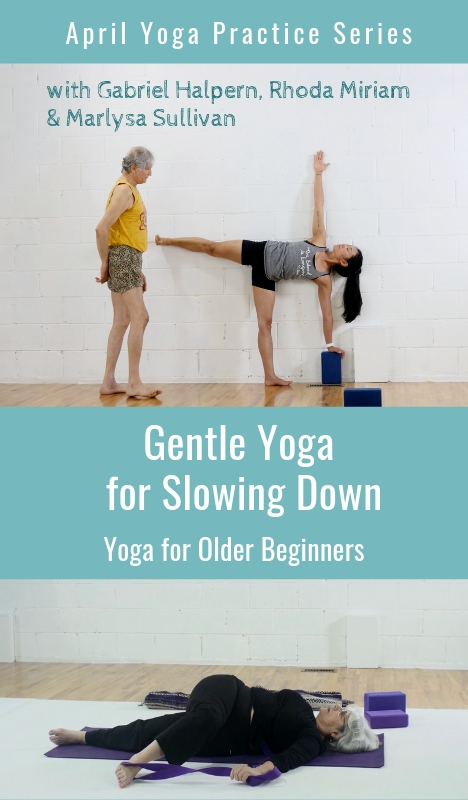 Keep all of that action (knees bent and all), and strongly press your hamstrings back as you lengthen your spine forward toward the wall in front of you. Take five rounds of breath before stepping toward the desk to come up. People often don’t realize that a lot of the tension in their upper back, shoulders, and neck is due to overly tight muscles in the front of the chest pulling their shoulders forward and causing rounding in the upper back. And considering almost everything we do (type, text, drive, cook, ride bikes, carry boxes, nurse babies, etcetera), we do with our arms out in front, closing off our chests, almost everyone could use this stretch throughout their day. Stand with your right side next to a wall. Place your right palm on the wall at the height of your shoulder with your thumb turned slightly up. Take a side step away from the wall, lengthening your arm but keeping your elbow bent. On an inhalation, lift up through the right side of your body, press your right elbow forward slightly, and move the head of your shoulder back. 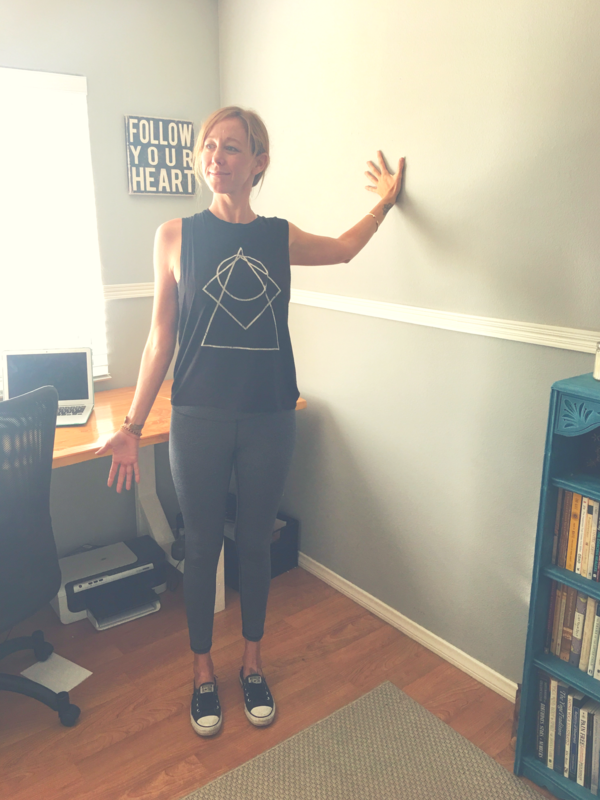 Spread your fingers and press your palm into the wall to draw your outer right shoulder blade deeper onto your upper back. Slowly begin to turn your chest more to the left, resisting with your right shoulder. (Note: the tendency when doing this stretch is to turn the chest too quickly, bringing the head of the shoulder forward and missing a lot of the stretch, particularly the pectoralis minor. After a few rounds of breath, turn back toward the wall and repeat on the opposite side. 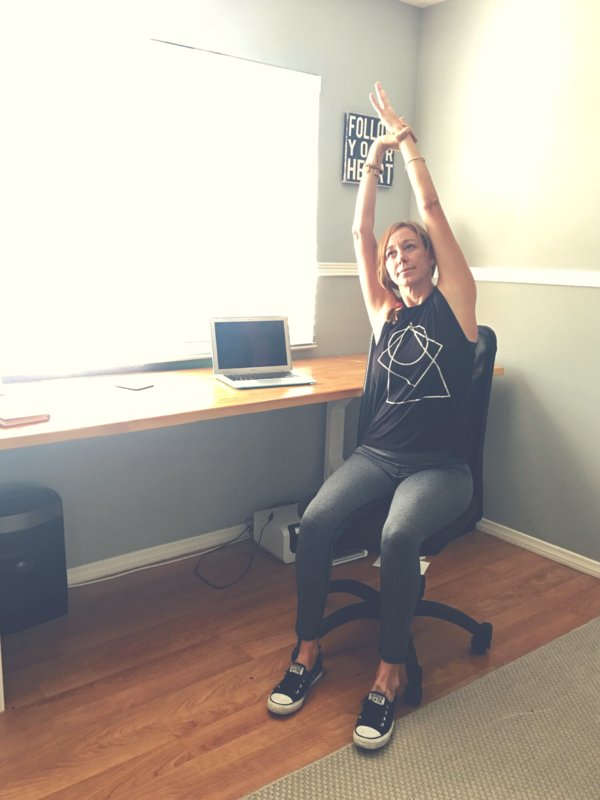 More helpful practice tips to balance out too much sitting from writer Christine Malossi and YogaUOnline-6 Yoga Poses to Counteract the Effects of Sitting. Too much sitting, need to restore balance? Study with Judith Hanson Lasater and YogaUOnline-Breathe, Heal, Relax and Renew: An Introducion to Teaching Restorative Yoga.